What Are Christians Doing About the Environment? One thing I do not understand at all is that true Christians are not doing anything to save the environment. Jesus told us to love our neighbours, and the poor, even our enemies. I guess He forgot to tell us to also love our great great great grandchildren. Jesus told us that the rich would find it hard to go to heaven. So you would think that He would like it if we could cut back on our luxurious greed driven lifestyles. But instead we continue to waste resources, which in turn destroys our environment. It's about time the Christians whether Roman Catholic, or born-again fundamentalists or anything else, to make up their minds, and choose - either conspicuous consumption or moral leadership. Canadians Need to Know: Who Will Be Funding their Political Parties? The Conservative government of Canada has announced it will drop all government funding to political parties, in an effort to save money. Opponents of this move can no longer block it because the Conservatives now have a majority government. Funding of political parties was originally introduced to prevent the big money interests from dominating the political system of Canada as it has in the USA. In the USA, where there is no vote-based taxpayer funding, apparently 90% of representatives time is taken up with fundraising, and 100% of their political support is given to repay top political donors. Canada has (for a short time anyway) a system of subsidizing parties based on their popular vote, and limiting donations outside the subsidy. In theory this system put more emphasis on doing the will of the voters, and less on doing the will of the wealthy political contributors and religious fanatics. It is believed the Conservatives will be the only party to benefit benefit from defunding, because they can raise the most money outside the subsidy. But we still have a limit on outside donors, although I wonder how long this will last, as I saw one political columnist in the Ottawa Citizen already calling for the abolition of these limits, claiming that abolishing these limits will not favour the Conservatives or hurt the opposition. As we see the Canadian Government cave in to outside funding pressure, I am hoping that we will also see an increase in reporting on where the funding comes from. In the case of the Liberals, I have no idea where it all came from. For the NDP, it was probably a lot of labour union support. I personally gave money to the Green Party, however I did not expected anything in return (and got nothing either). I suspect that the Conservative funding is coming from a combination of organized religion (especially the pro-life churches and Born Again Christians) and oil companies. These fundamentalist churches have already organized themselves into such a blatantly political force in the USA that no president can get elected without declaring he is for God. So far this religious faction has had to stay under cover in Canada, especially with Stephen Harper promising to not get involved in the abortion issue. But the fundamentalists are still giving money to the Conservatives in hope that as soon as the Conservatives take their seats as a majority government, they will begin to enact laws against abortion. There has already been a bitterly contested demonstration in Ottawa where I saw one the pro-Lifer in a TV interview boasting that they now had a majority of seats in parliament. The oil companies seem to be the main financial support for the Conservatives. The Conservatives are based in Alberta, the oil province, where most of the oil companies have head offices. Also, Harper has already followed the oil company line on global warming and pollution controls. The entire Conservative party is a mirror image of the Republican party in the USA. They are based in Alberta, which is the Canadian province most similar to Texas. The only thing missing is the old Southern slave states (the old Confederacy), for which happily there is no real parallel in Canada. But there is a parallel in the oil industry and in religion, in fact it is the Canadian branches of the same American oil companies and American religions that will be contributing most to the Canadian Conservative party. And ironically, or cynically, the Conservatives accused the Liberals of running a closeted American (Ignatieff) as their leader. So as we cut the taxpayer funding to political parties, let's at least find out for sure where the other funding is coming from, if that is at all possible any more. Why do Americans not learn about other countries in school? OK Maybe I need to back up, because many Americans do not even realize that other countries have their own histories, nor do they understand what American history has to do with the histories of other countries, such as Canada for example. Now this is going to seem a bit rambling, because I want to discuss why some maps should show neighbouring countries or states and some do not, and really don't need to. Then I will get back to why it is often necessary to study some of the history of neighbouring countries to understand your own history. I am often amazed looking at US TV station weather maps, where the weather is shown on a map of the USA, but on the other side of the US borders, no weather is shown. Remember the stations we get here are from Detroit, Erie and Buffalo, all places either on the border or across the water from Canada. You would think they should be concerned about what the weather is only 40 km away. In my opinion, weather maps should not stop at any borders. Road maps are the opposite, but for a good reason. If you are producing a road map of one state, you do not need to put all the roads in neighbouring states. This makes sense, because you are expected to buy the road map of any state you are travelling to, if you want to see all the roads up-to-date. Another situation I remember, I was in Mexico talking to some travelling motorcyclists from Texas about the best way to get into California from Ensenada, Mexico. I suggested Tecate as a border crossing that was easier than Tijuana, especially since they were heading home to Texas from there. They looked at their Mexican road map and said Tecate was no good because there were no roads leading from the border checkpoint into the USA. I told them that yes indeedy there were roads in California, and if they wanted to see the roads on the California side they should get a California road map. It is quite normal for any country or state to produce road maps that cover their own roads, but not all the roads in bordering states. When travelling in Ontario, for example, the 401 says "Windsor 250 km". It does not say "Detroit 252 km". That does not mean Detroit does not exist, nor does it mean Windsor is more important a city than Detroit. You are just expected to know that Windsor is the border city near Detroit and get a Michigan map to continue your journey. They do the opposite with road signs on the US side of the border. Now back to history. What could Americans possibly learn about their own history by learning about the history of Canada? First they would learn that Canada has repelled several US invasions, especially if you count some of the fighting that went on before the USA got its independence from Britain. The second thing that you could learn is that many English speaking Canadians are descendants of refugees from the US war of Independence. At one time, just after the war of independence, the number of American refugees in Canada was so great that they became a majority of English speaking Canadians. Here is the next question. Why do Americans not want to know about this part of Canadian history, which actually seems to be an integral part of their own history? Well, apparently some Americans did want to teach this part of American history. The part where Americans who were loyal to the British were forced out of the country after Independence. But other Americans decided that this part of their history should be buried, covered up, for the sake of national pride. After WW1. Charles Grant Miller, a writer for Hearst Newspapers, (forerunner of Fox News), started a campaign to rid America of unpatriotic history books. In particular a book called "An American History" by David Saville Muzzey. The Muzzey book had its flaws, for example a quote from it about native Americans reads "a stolid stupidity that no white man could match". But that's not what caused the hoopla. It was the part of the book that suggested some Americans, before the war of independence, considered themselves as Englishmen, and supported the King's government. That was the part that was treasonous to America. But once you remove the reference to loyal English-Americans from US history, how do you explain Canadian history? And how can you explain the American defeat in the war of 1812, in the attempted conquest of Canada? You can't, so you just better ignore that invasion altogether. And how do you explain that Canada started fighting Germany before the USA did? You can't, so you ignore the war before 1941. How do you ignore the part played by France in the US War of Independence? You can't so you just belittle the French generally to make yourself feel strong and brave. That's why teaching "patriotic" history requires large doses of ignorance. Recently Obama made a very courageous statement (for an American President) that Palestinians had a right to their pre-1967 borders, with some land swapping to be negotiated with Israel. Once again, the domestic right wing criticism of Obama's statement highlights that Obama is more in tune with international community than he is with the political factions inside the USA. And I mean that in a positive way about Obama, as many political factions in the USA tend to be somewhat warmongering. I recently viewed a blog by someone who put into words this warmongering character I mentioned. A warmonger is someone who believes that war is justified and inevitable, and more particularly, whoever is stronger has the right to take land from anyone who is weaker. Here is the link to this blog, and the argument presented on the Israeli border issue. So as a public service, I will post here the shortest possible condensed version of world history over at least the last 100 years, which explains partly why we have the United Nations and may help to explain why we have not had a third world war (even though it has been pretty close at times). From the beginning of recorded history, and probably all through human evolution, groups of men have tried to acquire territory or resources by aggression or warfare. But as the world gets ever more crowded, and as the weapons of war become ever more deadly, we have reached (or are reaching) a point in human evolution where war must be regulated, or contained, or damped down. Otherwise, the entire habitable world could be destroyed. The realization that mankind needed world peace actually grew long before the atomic bomb was discovered. Even by 1899, many people realized that human weaponry would soon become so powerful that entire civilizations could be wiped out by flying machines dropping massive bombs. Attempts to regulate wars were made before World War 1, then with even more urgency after World War 1 actually happened, and proved more devastating than even the peaceniks predicted. ("The War to End All Wars"). But even then, the efforts were not enough, WW2 took place, leading to more efforts toward world peace. After the horrors of World War 2, it seemed that the number one problem leading to war was that of countries trying to invade each other for territory or resources. So the United Nations was set up, with the participation of almost every country on Earth, with the main goal of avoiding another world war. It was decided that as a basic principle, that the UN should recognize and document international boundaries, and that no country had the right to invade another across those international boundaries, without the consent of the United Nations. The United Nations had a voting process and a charter that determined how this consent should be achieved. No matter how flawed this process might be, it was our best hope for world peace, and for many years the principle of not invading neighbours without the permission of the UN was more or less followed. But this required the leadership of the most influential democracies after WW2, namely the USA, France, Germany, Japan, and Great Britain. The USSR and China were influential, but not being democracies, it was expected that they would also be natural warmongers. Lately, it seems that this system is breaking down, and not because of rogue warmongering dictatorships like Nazi Germany or Stalin's USSR, but because of "democracies" like the United States of America, Britain, and Israel. Until now it was believed by many that a democracy was inherently peaceful. It was thought that most educated, democratic people would not vote for offensive wars. Now, however, that principle has been challenged by Israel (occupying and carving up the U.N. sanctioned territory of Palestine) and the USA and Britain, which invaded Iraq under false or mistaken (depending on who you believe) pretenses, without the approval of the U.N. Although to be fair, the USA and the UK (and a few other countries including Australia did claim they had the approval of the U.N., while Canada, France, Germany, Russia, China and most other countries said they did not have that approval. So where does world peace stand today? Are we back to the world where the strongest invade and occupy the weakest and steal their land and resources, or are we still trying to find a framework where all countries can live in peace? That is the essence of Obama's statement on Israel's boundaries. I often get emails asking about the value of old Honda CD175s. It is a difficult question to answer, so I will begin with how I much I paid (and why) for my first restoration project honda CD175 in 2001. In 2001 I was at the Paris (Ontario) Vintage motorcycle show. I had never tried to restore an old motorcycle up to that time, but I was thinking that since I had retired a few years ago, and was looking for something interesting to do, that an old motorcycle might be fun to restore and ride. While I was walking around to displays of old bikes, I met a friend who had a few old bikes she was working on, and she said one of them was a Honda 175. I immediately knew what kind of bike I was looking for, because my first bike was a Honda 175. I could already see myself riding around on a bike exactly like my first one that I had sold in 1972. Honda had made many different 175 models. Mine, which I bought in Africa, was an "international" specification CD175 K3 model with the solo seat configuration. The first place I looked was eBay, and coincidentally, on the first day I looked, I saw the exact model I wanted, in running condition. Although it was red, (not blue like my first bike), it looked exactly the same otherwise, and according to the blurb, it had been shipped to Canada many years ago from Kenya. Since then I have never seen another bike like it on eBay or anywhere else. It was fate. I don't want to turn this into an eBay rant, but I had no experience with eBay auctions, and I wanted this particular bike real bad. You may already realize that this was not going to result in a low price for me, and it didn't. But I wasn't a complete fool. So I set my maximum price at $2000, which was about double what most other Honda 175's of that time were selling for, although I noticed one earlier 175 auction had apparently resulted in a sale price of over $3000. But that alleged $3000 bike was in amazingly good condition. I put in my maximum bid early, believing eBay's story that this would be kept secret from other buyers. Having no experience at eBay, I knew nothing about "sniping", and "shill bidders". As the closing time drew near, another bidder pushed the auction price up to my maximum bid, bidding in small increments, and stopping when my limit was reached. So I did a little more research and discovered how to "snipe" this type of bidder at an auction, which is the only way to win against this type of incremental bidding. I had to go a little over my maximum limit, but I got the bike for $2050. I was prepared to pay up to $2500, but I think in retrospect, it was probably worth about half of that in an open auction. I picked up the bike in person, and paid cash after a test drive and verifying that the seller had advertised the bike honestly. Now here is an email I received recently, and my answer to explain the price of an old Honda similar to my CD175, remembering that it is not a highly sought after classic like the Vincent or Brough Superior. > bike. Is there any way you can help me with this? Thanks for your time. 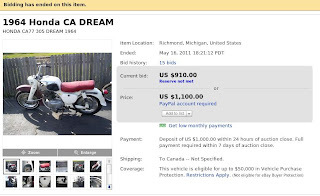 Your problem is typical, it is indeed very difficult to find the price of an old Japanese motorcycle. What you are selling is not really a motor vehicle, it is too old to be simply another motorcycle to learn how to ride on, and to ride back and forth to school. Instead, think of it as rare collectors item. Something that has mainly historical or nostalgic value. Prices of collector items can vary tremendously, based partly on their condition. This is what I would want to know, if I was interested in buying it. Is it complete? If it is missing parts, which parts? Some parts hard to find, some are they easy to replace. Is it running? If not, is it because the engine is frozen? As a buyer, I am also interested in your location: what country are you in? What city are you near? The top price can be asked for a motorcycle being sold by the original owner (or their family), which has always been stored indoors, has never been disassembled or repainted or crashed. And has the original bill of sale, owners manual and and tool kit. Lowest price would be for boxes of rusty broken parts of unknown origin. they do not understand what they are buying. Other buyers might be very knowledgeable collectors. eBay is a great place to sell something that you do not know the value of. Also, you can look for similar items on eBay to get an idea of what yours may be worth. Here is an auction for a 1964 Honda Dream. Also, pictures of the bike really help the buyer decide if they want it. Friday May 13, 2011. 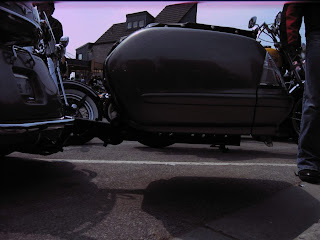 My second trip to Port Dover in 2011 fell on a Friday 13th, with perfect weather. Even the threat of rain showers later in the day might have scared some people off and reduced congestion a little. We assembled a group of five bikes and riders. The only new machine on this trip was a 250 Ninja, and in my opinion it's nice to see the 250 class well represented. Since I ended up being the ride leader that last few times, I prepared for the trip by looking at Google maps. I decided to use some strategy in order to not get tangled up in the traffic and road blocks. My strategy was to find the least likely way in to Port Dover, and that would be from the south. But because Lake Erie was to the south, I just went as far south as I could before moving in toward Dover in a classic one-sided pincer formation. Once again we were stopped by a police contingent for a safety check, at the same place as last year. This time they were not checking documents, just horn, brakes, and lights. So we didn't have to get off the bikes. They completed the five checks in about a minute, with one officer per bike. Mine however was the slowest. The rest of the gang thought it was because I was asking the female police officer for her phone number. I should have pretended I did, if only to enhance my legendary status. But actually it was because I couldn't figure out how to turn on the headlights. Taking a circuitous, yet speedy route, we arrived at the exact same parking lot as last year, locked up the bikes and headed off to get some apple fritters and see the bikes and the bikers. In the crowd, we spotted the naked guy again, although truth be told, he is not really naked. But still a lot more than you really want to see. Also there were some nice looking bikes. One new addition this year was the bikini bike wash. You would think with twenty thousand bikes, somebody would want a bike wash, but apparently not. First, most of the bikes were clean already, and she would only get water spots on the chrome. And the for rest of the bikes (like mine) that were too dirty to care about water spots, well they were parked too far away and inaccessible. How about next year a bikini shoe shine? I could go for that. One other new thing was seeing some people taking their pictures sitting on the police motorcycles. Looks to me like the Police are really going overboard to try to be nice. Maybe I should have asked for the female police officers number, and a hug too, just for passing the test. We got our apple fritters and coffee ** and were sitting by the dock when I decided to take a picture of the group. I was ready to take just the other four guys, but Matti suggested I could use the timer function to get myself into the picture. There was a convenient flat bollard right on the edge of the dock for me to perch my camera on. But I was unfamiliar with the timer button. So after a mad dash to pose, the first picture failed. A second attempt also resulted in failure. 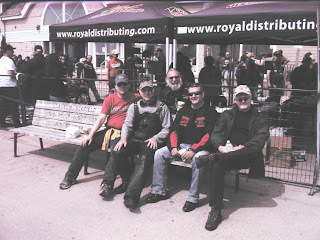 But then one of the girls from the Royal Distributing booth behind us took pity and came over to snap a few pics for us, with all five members of the group. Then, as usual, we got split up going back to the bikes, then miraculously found each other again, and made it home in a group before getting hit with any rain or hail. Picture 1: Thanks to Royal Distributing girl, finally a successful picture, except I forgot my camera's colour metering chip is screwed up. Picture 2: I decided that the trailer without wheels deserves a pic. This was NOT photoshopped. ** The link to the Apple fritter website is not a paid advertisement, and I have no commercial connection. It is merely a public service to anyone who likes motorcycles and real apple fritters. The Canadian Federal election of May, 2011 almost wiped out two of Canada's political parties, the Liberals and the Bloc Quebecois. I still do not understand what all the factors were in the outcome of the election, but this is an answer to some false impressions that have been left in the aftermath. There have also been a number of comments that Quebec is no more a distinct society than Alberta, or BC, or any other province. That's kind of like saying that Israel is no more a distinct middle Eastern country than Jordan, or Lebanon or Syria. Of course all those countries are distinct, just as all provinces are distinct. But some are more distinct than others, due to religion, history, size, language, or political leanings. These things are what makes Quebec distinct: Language, historical priority, and, until now, the tendency to support peace and leftist social programs. And with all that in one of the largest provinces of Canada, it is hard to ignore. Which province is most likely to actually separate from Canada? I would take a closer look at Alberta. Alberta has great oil reserves, and many of the residents of Alberta seem to feel that all the wealth from that oil should not be shared with Canada. This has been a point of contention for some time already, and as long as an Alberta-based government is in power over all of Canada, I guess they are happy. But what will happen when and if the Conservatives are ever defeated by an Eastern political party (or coalition of parties - which the Conservatives say is illegal). The Albertans seem to have a lot in common with Americans already, including religion, war and free market beliefs. Off you go then Mr. Duceppe! You and your former MPs are welcome to leave Canada anytime you like and no longer be citizens. Oh, and don't forget to return your $150K a year guaranteed pension paid for by Canada's tax payers at the door when you leave. This is echoing a popular American sentiment about liberals. "America love it or leave it", has become "Canada love it or leave it". The reason we don't often use American rhetoric in Canada is that it does not apply to our situation, where the history of Canada is trying to keep all the provinces together, including Quebec. The USA does not really have an analogous situation with two languages. Whatever happened to the crime of treason? Do we even understand the concept anymore? Why did we have federal MP's that were bent on division of Canada for so many years? How could Canadians let that happen? This is the time to make a law that prevents separatists from obtaining federal positions in parliament. Actually, I agree with Laurie in a way, except that I don't think even she understands what treason is. Go ahead and draft a law that prevents people who are bent on dividing Canada from holding federal positions in Parliament. If you bother to go through with that exercise, you will probably begin to see why we don't have that law. Here is "The Modified Red Dawn Scenario", for those who write "anti-separatist" laws, to help them avoid creating a problem for future generations of Canadians. Lets say that 40 million people from the Soviet Union immigrate to Canada, and make Russian the language of every province except Alberta. At that time, there may be a lot of separatist sentiment in Alberta. If Alberta continues to elect English speaking members of Parliament, many of those members also may have expressed separatist views. Do you want your Anti-Separatist law to exclude them from the Canadian House of Commons? Are they really traitors? If you feel that the Russian scenario is too far fetched, feel free to substitute any language/religion/ethnic/immigrant group of your choosing. Still think it is outrageously impossible? Review Canadian history, and you will see it already has happened once, possibly twice. I have started reading "History on Trial" by Nash, Crabtree, and Dunn. It's about the controversy in the USA concerning the history curriculum. And I must confess I don't understand people who think they can teach history without controversy. I have a personal experience that shows how controversial the teaching of history can be. Back in 2002, Mary Ann and I were touring out in the American West by motorcycle, and I wanted to visit the site of the Battle of Little Big Horn, where Custer's force was massacred by Indians. There was a National Historic Park, and historical interpretation centre there, and we dropped in to get the "story" (i.e. the interpretation of the events.) I was very surprised to see how balanced the interpretation was, giving the Indian's side of the story very sympathetically. I had expected a one sided condemnation of the Indians. But after about twenty minutes, I started looking around more and more, and came to realize we were not at the "Official" interpretive centre, we had been lured to an alternate interpretive centre set up by the Indians on their own land, which was kind of dressed up and signposted to look like the National Park Centre. Unfortunately, the National Park was closed by the time we got there, so I never got the other side of the story. 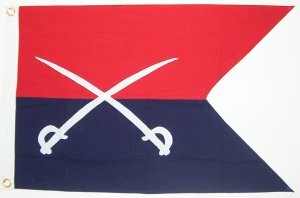 But one more thing I noticed, driving down the interstate highway, was a pickup truck flying the flag of the Seventh Cavalry, the very regiment that was massacred. I wish I knew why people were still flying those flags, but never had a chance to talk to the pickup truck driver. So that is one anecdote of my impressions of American history. I have more, but they will wait till another day. I have spent three years myself teaching Canadian history, and I enjoyed it more than teaching math, which was more my specialty. History is more fun than math because it is controversial, and as a teacher you have the opportunity to help students question what they are being taught. We had the text book, which was the curriculum, and it was the basis for all the "correct answers" on the exams. But instead of simply memorizing all the facts, I preferred to treat the facts as simply one side of the story in most cases, and we spent more time discussing than we did memorizing. The result, I thought, was that many of the students had more fun and actually remembered better. I see two sides to the teaching of History. One side is the curriculum, the "correct version" that must be taught. The other part is learning to interpret, question, and see other points of view, which are optional and depend to a large degree on the teacher and the students themselves. And this second part is much less subject to control by the authorities. Although, I can well imagine teaching in some schools where the parents may find out that someone has questioned something that they hold sacred, and may complain to the principal. But in my three years of teaching Canadian history, no parent ever complained to me that I was forcing their children to think for themselves. One of the reasons that history curriculum starts people fighting, is that some teachers and parents think that history must be taught without questioning. That means your curriculum has to be right from the start, then the students simply memorize everything and they get 100% if they know the material perfectly. That puts a lot more importance on the curriculum development than on the quality of the teachers. And the fact is, the curriculum will never be "right". I don't really know that much about how Americans teach history, but this is the impression I have had over the years, from watching American TV and movies, reading American books, talking to Americans about their history. They memorize all the presidents, in the correct order. They focus on the positive, and their history is full of white American heroes. They tend to ignore world history (e.g Canada), and anything that could be called a "downer" or anything that may undermine the impression that Americans are not the smartest, bravest, most decent people on Earth. Why is Canadian History not taught from such an extremely chauvinistic, one-sided point of view, like a mythical fable with very little questioning or interpretation? I can think of a few reasons. For one, Canada has two historical viewpoints that are taught in the classroom - the French and the English. (Although not usually in the same school system). And now, for all I know there may be more. Second, we have no reason to think that Canadians are a "special" people chosen by God, to lead the world. Third, we tend to not believe in the absolute truth of the Bible as much, meaning we are more accustomed to questioning the printed word. Picture: That's Custer's Seventh Cavalry flag in case you are ever out West and see it flying from a pickup truck. Cartoons have been used throughout history to spread propaganda. They are an excellent propaganda tool because they can be understood in many different languages, they are simple, take little time to absorb, are easily retained in memory. The written words can often be picked apart by astute readers, but many people looking at cartoons may not have the visual skills necessary to see what is wrong with it. Daryl Cagle's website, "The Political Cartoonist Index", has many current political cartoons arranged according to subject. Some are conservative, some liberal left wing. 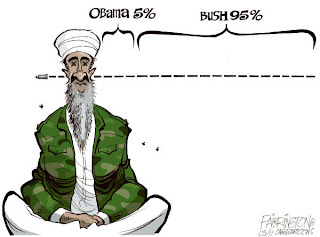 This particular cartoon, by Brian Fairrington, is intended to give the impression that George Bush and the Republicans have done 95% of the work in killing Osama Bin Laden. To many observers, this message will stick easily in their minds far better than the bullet stuck in Osama's. I have taken the next step, which is questioning the over simplification of this bit of right wing propaganda, and I have put my corrected version below it. Of course, both cartoons are an oversimplification of the actual operation. From what I can see, most Americans feel that all America deserves the credit for this operation. But if we must say who is especially responsible for getting revenge on Bin Laden, who was it? 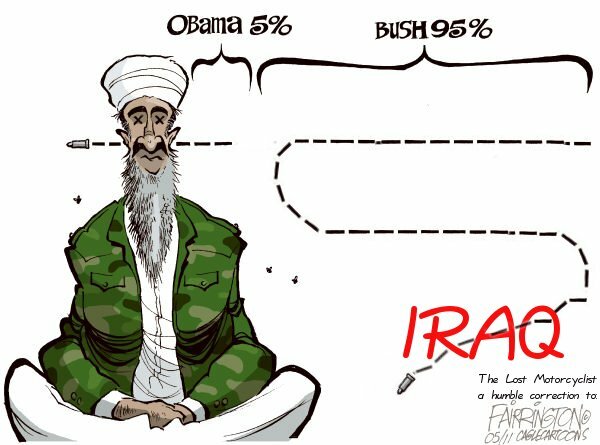 I have seen a lot of comments from apparently normal right wingers saying it was the troops who were 100% responsible for killing Bin Laden. These same people claim that Obama was no more than a brain dead puppet whose lips were being manipulated into mouthing "OKEY DOKEY" by his white military handlers. I disagree with their opinion. In fact if they were right, democracy itself would be in big trouble. A more realistic view is that many people had a part to play according to their assigned roles. Somebody had to make the helicopters, the guns and the bullets. Somebody had to sift through a million false leads on Bin Laden's whereabouts. Somebody had to decide which lead to follow up on. Somebody had to ride the helicopter with a gun, get off and aim and pull the trigger. Somebody had to drag the body aboard. I don't know who had to do all those things, and some people risked their lives. But there was also the one person who had to give the go-ahead to use American Forces to penetrate the territory of an ally without notification. And that same person will have to deal with the retaliation not only from Al Quaeda, but from Pakistan. Instead of a retaliatory strike, Pakistan could deny America access to the only road bringing supplies to the troops in Afghanistan (That includes Canadian troops too!). The guy who pulled the trigger risked his life, just as many other people are risking their lives all the time, including civilians (and including Obama in case you forget!). Obama, (luckily or by design, you decide) has taken a peaceful position that is far more acceptable to the international community than G W Bush's bullying torturing aggressiveness. So it will be far easier for Obama to smooth the ruffled feathers from this intrusion into Pakistan than it would have been for Bush. How about giving credit for that, you war hawks? credit for doing it right as the blame he would have taken for an epic failure. Is that fair? Picture: The second cartoon is my photoshopped "correction" of the first to show the opposite point of view. This morning I woke up to the news that Osama Bin Laden had been killed by a US special forces team. As this is a stroke of luck of epic proportions for Barack Obama, I was wondering what the unlucky Republicans would come up with to counterattack. Maybe they would make it look like Obama tried to block the military strike? First I heard Donald Rumsfelt on NBC this morning. He seemed to think that he himself (Rummy) was the one who actually set up the situation that caught Bin Laden. He claimed it was all about intelligence, having good information. And why do they have this good information? Because of the prisoners being held at Guantamo Bay, which he initiated and Obama opposes. I thought Rummy's opinion was amusing, if not downright sidesplitting. How can prisoners in Guantanamo provide minute by minute info on Osama Bin Laden's whereabouts, ten years after being taken captive? LOLIG (stands for LOL I GUESS). But I was really waiting for Rush Limbaugh, the guy who usually sets the party line for the conservative right wingers. And Rush's response truly floored me. He gave all the credit to Obama for thinking of sending special forces instead of carpet bombing. Now the worry is that Rush may have been saying this sarcastically, of course. Especially when he said "Thank God for Obama" (how can you thank God for the Antichrist?) But anyway, a lot of people are going to be scratching their heads over his response for some time to come. Was he on drugs? Is Limbaugh's message a hoax? When is Rush going to get back to shi*t*ng on Obama as usual?